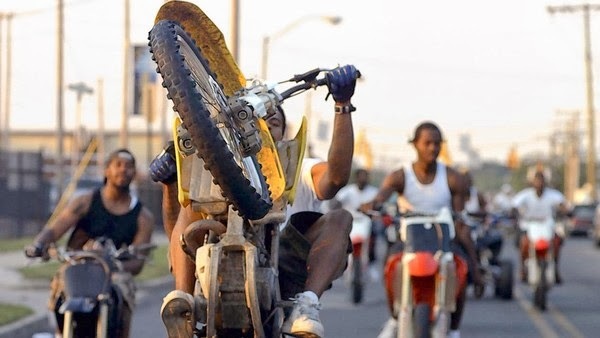 Synopsis:The 12 O'CLOCK BOYS are a notorious urban dirt bike pack in Baltimore -- popping wheelies and weaving at excessive speeds through traffic, the group impressively evades the hamstrung police. In Lotfy Nathan's wild, dynamic documentary (three years in the making), their stunning antics are envisioned through the eyes of young adolescent Pug - a bright kid from the Westside obsessed with the riders and willing to do anything to join their ranks. The free screening of 12 O'Clock Boys will take place at The Maple Theater in Bloomfield Hills, MI at 7:30pm on Tuesday, January 28th. Contest Rules: Only enter if you live in Michigan. Winners will be chosen at random and seating is on a 1st come 1st serve basis. Please arrive early, as it may be overbooked. Winners will be notified on Monday January 27th. Enjoy the film if you win.